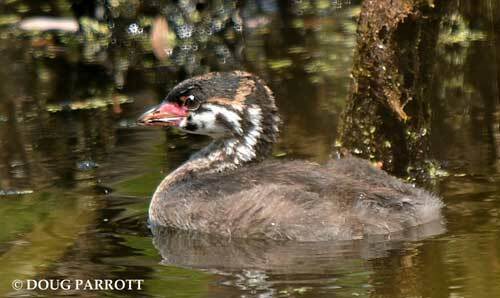 The “teenage” Pied-billed Grebe who hatched out on Main Pond here at Montlake Fill was busy catching fish again today. His parents left him on his own at least three weeks ago, a very tender age to be all alone in the world. You might say they threw him in the deep end of the pond, except this pond is nowhere very deep. That’s a good thing because the only fish that thrive here are tiny minnows, just the right size for a small grebe to eat. The pond sustains this little guy bountifully, so perhaps it is no accident his parents chose it for their nest back in April. They must have known their baby would be confined here a long time, unable to leave until he grows his flight feathers. Pied-billed grebes cannot walk – their legs and feet are set too far back on their bodies, so at best they can flop forward a few inches at a time, hunching with their toes and “ankles.” Grebes do much better underwater, where they can rotate their feet 90 degrees, turning them into effective paddles. On still days like today, I can follow the youngster’s progress underwater because of the air bubbles he releases periodically. The grebe’s bubble-path reminds me of the ring of bright water that Gavin Maxwell’s otter Mij made as he dove for food. A large ring ripples out from the grebe’s dive site, spreading leisurely in even-spaced circles across the mirror surface of the pond. A few feet further on, a smaller ring appears, marking the grebe’s progress. I watch for the next sign, a ring still smaller. Then the grebe himself breaks the surface of the water, shaking his head and sprinkling droplets all around, like diamonds strewn on satin. Perfection. This entry was posted in Uncategorized on September 4, 2011 by constancesidles.